The bhikkhu community at Amaravati was founded by Luang Por Sumedho in 1984. Its first members came from Cittaviveka Monastery. Many had spent some time training in Thailand at Wat Pah Pong. There are usually between fifteen and twenty-five bhikkhus and sāmaneras in residence at Amaravati, living a contemplative, celibate, mendicant life according to the Vinaya and Dhamma. They provide a living link with the Order founded by the Buddha over two thousand years ago. The community also includes anagārikas, white-robed postulants observing the Eight Precepts, who after a year or two may be given sāmanera ordination. The community is not static as there are close links with the other branch monasteries in England and abroad; bhikkhus and sāmaneras move between the monasteries. In November 2010 Luang Por Sumedho handed over the duties of Abbot of Amaravati to Ajahn Amaro and is now based in Thailand, where his monastic life began in 1966. In 1966, he went to Thailand to practise meditation at Wat Mahathat in Bangkok. Not long afterwards he went forth as a novice monk in a remote part of the country, Nong Khai, and a year of solitary practice followed; he received full admission into the Sangha in 1967. Although fruitful, the solitary practice showed him the need for a teacher who could more actively guide him. A fortuitous encounter with a visiting monk led him to Ubon province to practise with Venerable Ajahn Chah. He took dependence from Ajahn Chah and remained under his close guidance for ten years. In 1975, Luang Por Sumedho established Wat Pah Nanachat (International Forest Monastery) where Westerners could be trained in English. Luang Por Sumedho has inducted more than a hundred aspirants of many nationalities into the samaṇa life, and has established four monasteries in England, as well as branch monasteries overseas. In late 2010 he retired as abbot of Amaravati Buddhist Monastery in Hertfordshire. Since then he has been living in Thailand, and continues to share the Dhamma both there and in other countries. Ajahn Amaro has written a number of books, including an account of an 830-mile trek from Chithurst to Harnham Vihara called Tudong - the Long Road North, republished in the expanded book Silent Rain. His other publications include Small Boat, Great Mountain (2003), Rain on the Nile (2009) and The Island - An Anthology of the Buddha's Teachings on Nibbana (2009) co-written with Ajahn Pasanno, a guide to meditation called Finding the Missing Peace and other works dealing with various aspects of Buddhism. In December 2015, along with Ajahn Pasanno, Ajahn Amaro was honoured by the King of Thailand with the ecclesiastical title ‘Chao Khun’. Together with this honour he was given the name ‘Videsabuddhiguna’. Ajahn Nyanarato (Shigehito Nakao) was born in 1958, in Nara, Japan. His profound interest in the meaning of life began when he was being trained as a doctor in Kyoto University. After graduation, he decided to go to India on a spiritual quest instead of becoming a doctor. He spent one year there and then moved on to Thailand, where he visited various monasteries including Wat Pak Nam and Wat Suan Mokkh. After another year of exploring in Thailand he came to Wat Pah Nanachat. Impressed by the serene presence of the Sangha there, he finally found a place to settle. In 1986 he was ordained as a sāmanera and he received upasampadā the following year. When Ajahn Gavesako set up Wat Sunandavanaram in Kanchanaburi in 1990, Ajahn Nyanarato joined that community and lived there for ten years. He also worked for Maya Gotami Foundation, a charity for poor youth in Thailand established by Ajahn Gavesako. In 2000, Ajahn Nyanarato went to Nepal, intending subsequently to spend a few years in Sri Lanka, but the political situation there at that time did not allow him to do so. As he was also interested in learning how to live in the Sangha in the West, he came to England instead and spent the Vassa at Chithurst. He moved to Amaravati in 2001. Deeply inspired by Luang Por Sumedho and his teaching, he has resided there ever since. Ajahn Ratanavanno was born in Korat, north-east Thailand, on 10 February 1971. After finishing high school he worked in an industrial concern for a year, and then, as he had not been called up for military service, he decided to become a monk for three months. Those three months have extended indefinitely. In his fifth year as a monk Ajahn Ratanavanno moved to Wat Pah Nanachat, where he acted as the monastery secretary. In 1999 he spent a year at Abhayagiri Monastery, before moving to Amaravati in 2001. 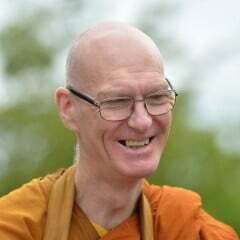 Ajahn Ratanavanno returned to Amaravati in late November 2012, after spending the three previous years back in Thailand. He continued his career as a lecturer in Industrial Language Training, but began to spend more time with the Sangha, usually going on brief retreats or giving lifts to monks. In 1984 he helped to establish a meditation group in Northampton, and he hosted those senior monks who came there to teach. In 1985 he took a year off work to spend time as an anagārika at Amaravati and Chithurst. This experiment finally extended to twenty months, and although he eventually returned to the lay life it was to a different job, teaching in a secondary school in Croydon. During the next four and a half years he studied for an MA at Essex University, among other things. The realization gradually dawned that being ordained was what he really needed to do, and that his more worldly interests were of lesser importance. In 1991 he returned to Amaravati to re-ordain as an anagārika and was happy to spend two years in that role there and in two other monasteries. In July 1993 he took upasampadā with Luang Por Sumedho at Chithurst and trained initially with Ajahn Sucitto as his acariya (instructor). Between 1997 and 2004 he went on to train in Switzerland, then Italy, followed by a return to Amaravati and then to Chithurst again, before going overseas to Australia and New Zealand. He spent time in different monasteries in Australia, before living for two years at Bodhinyanarama Monastery in Wellington. Ajahn Nyanadassano is of Czech origin, although he grew up with his Russian father in Latvia. He came to Amaravati in the autumn of 1999, with the interest to become a monk. 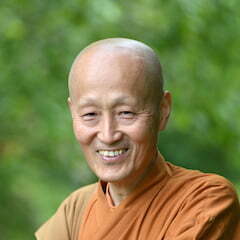 Ajahn Nyanadassano received the Full Acceptance (Upasampada) as a bhikkhu on 21 July 2002 and spent the following year at Chithurst Buddhist Monastery. After another period of time living at Amaravati, Ajahn Nyanadassano spent a year in Thailand, living mostly at Wat Pah Nanachat. He also spent some time in Wat Pah Pong and Dtao Dum before returning to Amaravati in 2006. Over the past several years, Ajahn Nyanadassano has lived at monasteries in Italy, New Zealand, Thailand and Portugal. In November 2015 he returned to Amaravati. 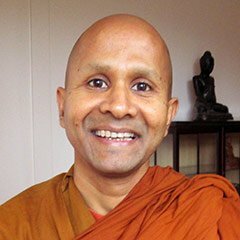 Bhikkhu Vinīta was born in Embilipitiya, Sri Lanka, in January 1977, and joined the Sangha there as a Sāmanera (novice) in 1994. His first meditation teacher, Venerable Inguruwatte Piyananda Mahanāyaka Thera, was the mentor who gave him the Sāmanera ‘going forth’. In 1995 Bhikkhu Vinīta met Ajahn Vimalo, one of the Western disciples of Ajahn Sumedho who was living in Sri Lanka at that time. This meeting finally brought Bhikkhu Vinīta for his first visit to Amaravati in 2003. In 2005 he returned to Amaravati to stay and practise the monastic life with Ajahn Sumedho as his teacher. In 2006 he received full acceptance into the Bhikkhu Sangha (Upasampadā) in the Temple at Amaravati, with Ajahn Sumedho as his Upajjhāya (preceptor). Since then Bhikkhu Vinīta has spent time in other Forest Sangha associated monasteries in the UK. 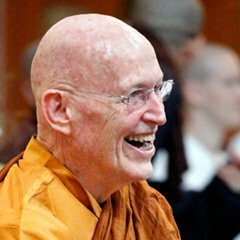 Currently he is back at Amaravati practising monastic life under Ajahn Amaro. Ven. Santamano was born in Wallasey in 1980. He and his parents moved to India for a few years before returning to England in 1993. His initial interest in Buddhism came through reading the works of D T Suzuki and started going to meditation classes at the Buddhist Society in London. There he learned of Amaravati and started listening to Dhamma Talks on the Internet. Ven. Santamano began visiting Amaravati as a guest and coming to retreats. He took the anagarika precepts in December 2008 and received the pabbajja (novice 'going forth') on 27 July, 2010, with Luang Por Sumedho as preceptor. On 10 July, 2011 Ven. Santamano received the upasampadā, or full admission into the bhikkhu sangha, with Ajahn Amaro as his preceptor. Venerable Thanavaro was born in Budapest, Hungary, where he studied and practised Buddhism before coming to Amaravati for the first time in 2007. He took the anagārika precepts in July 2009 and received pabbajja (novice ordination) on 27 July 2010, with Luang Por Sumedho as preceptor. On 10 July 2011 Ven. 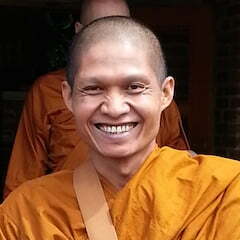 Thanavaro received full ordination as a bhikkhu, with Ajahn Amaro as his preceptor. Venerable Ruciro was born in Croydon, South London in 1978. He studied at university and achieved two degrees, one in Sports Science and the other in Physiotherapy. For eight years Venerable Ruciro worked for the National Health Service (NHS) as a physiotherapist, specializing in the field of neurology during the last three years. He first became interested in Buddhist meditation as a way of coping with ‘stress’ when he was twenty-five years old. He started visiting Wat Buddhapadipa in Wimbledon, London on a regular basis, and later began coming to Amaravati. He attended retreats in Thailand (Wat Suan Mokkh and Wat Umong), and also spent ten days at a monastery in Sri Lanka.Venerable Ruciro was extremely inspired by Luang Por Sumedho and his teachings, and similarly by Ajahn Amaro. This culminated in his decision to ‘go forth’ as an anagārika at a ceremony held at Amaravati on 25 August 2012.Venerable Ruciro requested the sāmanera pabbajjā on 10 August 2013, at a ceremony held in the Amaravati Temple. Ven. Dhammavicayo was born in 1972 in Würzburg, Germany. He started early in life with the development of computer software and worked professionally in that field for 18 years. When he was 30 years old he moved from the area of Frankfurt to Switzerland where he lived for 9 years and worked the last 4 years for a Swiss bank. During that time he studied at a university in Bern and completed a BSc. in Business Administration. These last years were especially demanding and added to a general feeling of discontent with life. During his search for new ideas, he signed up for a meditation class without really knowing what it was all about. After taking up a regular meditation practice, he could see the positive effects of the Buddha's teachings for himself. He subsequently joined a meditation group in Bern, also spending his annual leave on Vipassana meditation retreats in Switzerland and the USA. Through the meditation group, he heard about Dhammapala Monastery in Kandersteg where he became a regular guest. For him, there was a stark contrast between the peaceful environment of the monastery and the dissatisfying work life in the bank. One day, rather suddenly, the idea came up to leave lay-life behind and to ordain as a monk. While not really doubting this was the right way, he nevertheless decided to participate in a 2-month retreat in the USA to see if his mind changed. As it didn't, he made enquiries for a suitable monastery and decided to ask for the training at Aruna Ratanagiri near Newcastle in the UK. At Aruna Ratanagiri, he took up the Anagārika training in February 2012 with Ajahn Munindo and received the pabbajja (novice 'going forth') in March 2013, again with Ajahn Munindo who gave him the name Dhammavicayo. In June 2014 he moved to Amaravati and received the upasampadā, the full ordination as a Bhikkhu, on 21 December 2014 with Ajahn Amaro as his preceptor. Venerable Dīpako was born in Rennes, France, of Chinese-Cambodian parents. At university he studied civil engineering and graduated with a master’s degree. During his annual holidays he made several trips to South-East Asia. In 2006, while travelling in Thailand, he was fortunate to meet a Thai student who took him to Wat Pah Nanachat, the International Forest Monastery. It was there that he developed a great interest in Buddhism, particularly in the tradition of Ajahn Chah. He spent one year at Amaravati as an anagārika, after which he formally requested the Sāmanera Pabbajja (novice going forth) at a ceremony held on 26 October 2013. His upasampadā, or full admission into the bhikkhu sangha, was held at Amaravati on 21 December 2014, with Ajahn Amaro as his preceptor. Venerable Supañño was born in France in 1978. After obtaining a degree in physics he moved to England, where he discovered Buddhism and meditation. His interest in meditation grew and the scientific aspect of Theravada Buddhism attracted him. He decided to leave the lay life after spending some time in a Theravada monastery. His anagārika precept ceremony was held in 2011 at Chithurst, and received the Sāmanera Pabbajja, or novice 'going forth', at Amaravati in October 2014. His upasampadā, or full admission into the bhikkhu sangha, was held at Amaravati on 29 November 2015, with Ajahn Amaro as his preceptor. Venerable Anejo was born in Sweden in 1982. He always had an interest in the big questions in life, and the Buddha’s path seemed to offer a meaningful and most worthwhile way of living. Inspired by the great Thai Forest teachers, he took up practice in the Theravada tradition. After visiting several monasteries and training for one year in Thailand, he decided to continue his training in the West. His anagārika ‘going forth’ ceremony was held in December 2013. He formally requested the Sāmanera Pabbajja (novice going forth) at Amaravati in December 2014. His upasampadā, or full admission into the bhikkhu sangha, was held at Amaravati on 29 November 2015, with Ajahn Amaro as his preceptor. Ven. Jinavaro was born in Brittany, France in 1991. He began his monastic life at Aruna Ratanagiri in Northumberland and received upasampadā (Bhikkhu ordination) in 2017 with Ajahn Amaro as preceptor. Venerable Balado (Walter Meusburger) was born in 1960 in Goetzis, Austria into a family with a roman catholic background. After commercial school and army service he worked in accounting for some years. Then studied social work in Bregenz, most of the time working in the field of addiction therapy. In 1992 he attended a zen sesshin (retreat) led by a jesuit priest, where he learned the practice of sitting in stillness and appreciated the simple structure of the formal meditation and the focus on the body-mind. Two years later he turned his interest to the teachings of the Buddha and joined sesshins in the soto-zen tradition with Fumon Nakagawa Roshi. In 2006, he took a 4-month-sabbatical in Thailand and attended several retreats at Wat Kow Tahm. He was particularly affected by the teachings on the five hindrances which brought a new understanding to the practice of meditation with regard to experiences of distress in daily life. The teachings on Anapanasati at Wat Suan Mokkh also became a substantial support as a way of coping with distress and developing an anchor for the body-mind. It was at this time, that the vision of a simple life as a monk first crossed his mind, but the household life seemed still be bearable and gratifying enough. In 2014, after another time-limited work contract, he decided to take up the ‘homeless life’ and become an anagārika. His Anagārika Precept Ceremony was held at Amaravati on 2 May 2015. He then received the Pabbajjā or novice 'going forth' on 20 May 2016, and full acceptance into the Bhikkhu-Sangha on 2 July 2017, with Ajahn Amaro acting as preceptor. 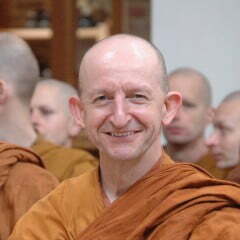 Bhikkhu Pasādo was born in Bletchley, England in 1970. His first contact with Buddhism happened through a number of inspiring events of good fortune and acts of kindness from people he met while travelling through India. It was at this time that the idea of becoming a Buddhist monk first arose in his mind. Later Bhikkhu Pasādo encountered the Thai Forest Tradition through attending meditation classes at a Samatha Meditation Centre, while he was studying in Manchester. He was inspired by a book he received about the life of Ajahn Tate, who practised meditation in the seclusion of the forests of Thailand. After completing his degree course, his interests in hydrogeology took him to Kent where he lived and worked for many years. Bhikkhu Pasādo started attending a local Buddhist group in Maidstone, Kent, which greatly helped to support and deepen his practice. It was during this time that Bhikkhu Pasādo first heard the teachings of Ajahn Chah and was inspired by his simple, direct style of teaching. Bhikkhu Pasādo began attending meditation retreats at a number of centres around England including Amaravati Buddhist Monastery. His confidence grew in the Buddhist path and with it came a firm aspiration to enter into monastic training. Eventually, through good fortune, the right conditions came about for him to leave the household life and enter into homelessness, and his Anagārika Precept Ceremony was held on the full moon observance day on 2 May 2015. He received the Pabbajjā or novice 'going forth' in a ceremony held at Amaravati on 20 May 2016, and Full Acceptance into the Bhikkhu-Sangha on 2 July 2017, with Ajahn Amaro acting as preceptor. Bhikkhu Pasādo would like to express his heartfelt gratitude for all of the kindness and wisdom he has received from those practising Dhamma across the world. Venerable Issaro was born in Stalowa Wola, south-east Poland, in 1985. His search for true happiness brought him to the Buddha’s teachings. Initially he did not want to meditate, until he read the life story of an extraordinary female meditation master, Dipa Ma, which marked a turning-point in his life. In 2009 he attended his first 10-day Vipassana Meditation course, taught by SN Goenka. While his interest in the Dhamma was increasing, he discovered the teachings of Ajahn Chah, Ajahn Sumedho and other great Thai Forest Tradition masters. He decided to request to undertake the anagārika training at Amaravati, and his Anagārika Precept Ceremony was held on 17 November 2013. Venerable Issaro received the pabbajja or novice 'going forth' in a ceremony held at Amaravati on 2 May 2015. On 27 July 2018, he received full acceptance as a Bhikkhu with Ajahn Amaro as preceptor. Ven. Manuñño (Didier Linares) grew up in the South of France. As a teenager, a brief description of Buddhism in a book led to a Eureka moment and an ongoing fascination with Buddhism. He went on study chemistry, but just before completing his engineer’s degree, he moved to London in the late 90s, where he ended up working as a night editor in a media monitoring company. In 2004, the obsessive reading of Dhamma books resumed and the search for ‘the perfect teacher’ began. The journey started with Tibetan Buddhism before discovering the teaching of Dogen Zenji and Soto Zen. In 2006, while looking online for longer meditation retreats near London, he found Amaravati. Numerous retreats at Amaravati Retreat Centre led to a growing appreciation for the teaching of Luang Por Chah and the Thai Forest Tradition, and culminated in Ven. Manuñño joining the community as the Retreat Centre Household Manager, a role he remained in for three years. In 2016, Ven. Manuñño finally decided to jump in the deep end by requesting the Anagārika training. On 27 July 2018, he received full acceptance as a Bhikkhu with Ajahn Amaro as preceptor. Before moving to Amaravati in January 2016, Venerable Niddaro worked in London, where he discovered Buddhism. He was born and raised in Mexico City, and studied in California. On 27 July 2018, he received full acceptance as a Bhikkhu with Ajahn Amaro as preceptor. 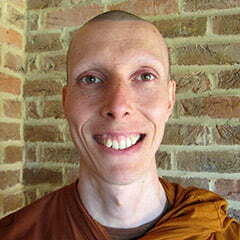 Bhikkhu Jayadhammo was born in Doncaster, England in 1979. He joined the community at Harnham Buddhist Monastery in 2013, where he stayed for three years, initially as a lay-resident and then going on to train as an Anagarika. He continued his training at Chithurst Buddhist Monastery, where he received Pabbajja as a Samanera ('Going Forth' as a novice monk), before joining the community at Amaravati in 2018. Before joining the monastic life, Dīghadassī (Jeroen Akershoek) was living and working in the Netherlands as a System Developer and Administrator. He had a good job, but felt uncomfortable about being part of an economic society that is based on greed and competition, while the negative impact this has on people and the environment is so obvious. It seemed to him that living this way had no meaningful purpose, but he could not see an alternative. Subsequently, he became interested in meditation but eventually grew weary because it only seemed to offer temporary relief from the stress of modern society. It did not give him the answers he was looking for. In 2013 he came in contact with the Buddha's Teachings through a 10 day Goenka Vipassana course, which had a big impact on him. It gave him the confidence and trust that there actually is a complete teaching for living a wholesome and purposeful life. One year later, after reading the book 'The Buddha and his Teachings' by Ven. Narada, he seriously started thinking about entering the monastic life. He discovered the Thai Forest Tradition and was drawn by Ajahn Chah's simple and direct teachings. He started living at Amaravati in 2016. His upasampadā or full acceptance into the Bhikkhu Sangha was in December of 2018. Sāmanera Jalito was born in Latvia in 1986. His first contact with Buddhism came during his studies in high school. At the age of 21, when going through a difficult time in his life, he came upon a transcript of a talk given by Ajahn Sumedho. It deeply resonated with Sāmanera Jalito, and for the first time he visited one of the monasteries established by Ajahn Sumedho. After years of trying to settle in the worldly life, he returned to a monastery at the age of 28. Two years later he took on the training and white robes as an anagārika, and received the pabbajja or novice 'going forth' in a ceremony on the 3 June 2018, with Ajahn Amaro as his preceptor.